I guess the news of the day is the fact that the Apple iPad was released yesterday. I am very excited about the productivity aspects of the iPad and will be writing a few iPad Productivity posts this week. Being based in the UK I do not have my hands on an iPad yet and I am still awaiting the UK release date. My first link for this week is a link to a great post titled 13 small things to simplify your workday from ZenHabits. ZenHabits do a great job at producing excellent blog posts and this one is no exception. My second link is a link to a post titled Procrastination: Feeling overwhelmed, helpless and ready to run away. Procrastination is something that affects us all and this post makes good reading for all. My third link is to the a post from thecynh.com titled 17 Ways for Lone Entrepreneurs to Stay Motivated. This is a very interesting post about a real problem that a lot of self made entrepreneurs suffer from at some time in the lives. More and more people are setting up on their own but they lack the interaction of being in a busy environment and this can bring with it issues relating to motivation. This post tries to look at some ways to avoid this issue. My fourth link is a link to the news that Evernote for the iPad has arrived!. I love and use Evernote daily and this just looks like an awesome app on the iPad. Boy I cannot wait to see this one! My fifth and last link is a link to Things, the GTD Application, for the Apple iPad. I have covered and reviewed Things on this blog in depth and this is the first GTD app to market for the new iPad. Looking forward to seeing how it performs. This entry was posted in Cool Software, General Items, GTD and Productivity Links, GTD General, iPad Productivity, iPhone Productivity and tagged Apple iPad, iPad, Procrastination, Productivity Links, things on April 4, 2010 by Andrew Mason. I am actually writing this on Friday the 12th of March, my birthday and I am 37 today, or in Hex 0x25 which sounds much better! I am currently away enjoying myself at the Samling in the Lake District with my wife so this post is on autopilot! My first link for this week is to a great post titled Productivity and Procrastination from the Quandry Factory blog. This detailed post looks at procrastination and provides some fresh ideas on how to blast through procrastination in order to achieve a higher level of productivity. My second link is a link to another great post from ZenHabits titled The Lost Practice of Resting One Day Each Week. Great post that is so true! I know I have lost this ability. My third link is to the a post covering how to set priorities. This post also includes a video explaining how the author sets priorities. Full of good pointers on how to ascertain what is important and what isn’t. My fourth link is a link to a GTD for Academics from the GTDTimes blog. This in depth article looks at how the GTD Methodology can be used by academics to get things done! My fifth and last link is a link to Part 2 of a Series of Getting Things Done with a Mac. This second part covers the use of the Things GTD Application to work as your partner for the Getting Things Done (GTD) Methodology. This entry was posted in General Items, GTD and Productivity Links, GTD General, Motivation and tagged gtd, Procrastination, productivity, Productivity Links, things on March 14, 2010 by Andrew Mason. After a hectic week I am tonight preparing to visit the 2009 A4UExpo that is held over the next few days at the Excel conference centre in London. Looking forward to meeting a lot of old friends and also hoping for a bit of inspiration to start some new projects this side of Christmas. My first link for this week is an old but very good post titled What is Wrong with GTD. This post was doing the rounds on Twitter so I thought I would mention it again although I linked to it in the past. Well worth a read and I would love to know your thoughts on the subject. My second link is a link to a nice post on how to set up Evernote as a GTD system in 15 minutes. It is no secret that Evernote is a tool I use and love although I do not use it as a GTD system. Interesting yo see how the author does it. Would this work for you? My third link is a post from Nik Agarwal titled I’m Joining the GTD Bandwagon. This is a good intro to GTD and explains why the author of the post decided to give it a shot. I always like reading this type of posts to see how other people discover GTD and their initial thoughts on the methodology. My fourth link is a link to a nice comparison of the two leading Mac GTD Apps, OmniFocus and Things. I am a long time OmniFocus user, ever since the very early beta although I must admit that the look of Things has taken my eye quite a few times. My fifth and last link is a link to part one of a GTD Series from The Productive Organizer. This initial post int eh series provides an overview of the Getting Things Done methodology. Great series of posts that I recommend you to check out. This entry was posted in General Items, GTD and Productivity Links, GTD General and tagged evernote, gtd, omnifocus, Productivity Links, things on October 11, 2009 by Andrew Mason. I have eventually got around to taking a better look at the Mac GTD app, Things, and adding to a review that I did a while ago. I currently use OmniFocus but Things and The Hit List are grabbing my attention. Anyway, here is my review and thoughts about Things. Things is a blandly named but ultimately excellent organizational application designed for use through a variety of mediums. The visual approach taken by Things is simple enough to keep everything easily accessible while still maintaining an impressive level of flare. Designers have given the software a certain level of sheen although the layout will look immediately familiar to users who are accustomed to the aesthetic of Mac-developed programs. The most useful features are well-labeled and located in a well-organized and convenient manner. Icons are all colorful and easy to locate as well and this is something which helps in navigating them against the otherwise grey and white interface. The program provides users with a solid level of productivity access through a great list of truly useful features. Among the laundry list of options are GTD staple categories such as Today, Next, Someday and Postpone sorting categories with appropriate sub-lists available within each parent grouping. Perhaps most useful is an included HUD option, something which is a truly fantastic feature and allows for quick, no-nonsense inputting of any upcoming task on the user’s mind. Things also does a great job of keeping the main window clutter-free by way of a feature which removes columns and instead opts to display only relevant information for upcoming tasks. Mobile access is set up and ready to go through a few different platforms including the ever popular support for both the iPhone and iPod Touch Apps. While it seems that smartphone access may initially be limited to the two aforementioned devices Things does do a little bit to extend remote usage by programming a built-in collaboration feature which promises to link any user’s work with any desired colleague. As of now an exhaustive wiki accompanies a regular blog and burgeoning forum to provide quite a bit of promise for those users who hope to find other Things devotees to discuss the program with. If this element of the project is kept up with then it would seem that peer support and company interaction won’t be an issue upon release. Things is impressive with a clean interface, excellent user support and great list of features could make Things one of the few productivity programs worthy of plunking down any real money for. It’s definitely worth the time necessary to check out to decide for yourself. I am sticking with OmniFocus for now. But Things has officially got my attention! Well, over to you, my readers. How many of you use Things and how many use OmniFocus or another app to get things done? This entry was posted in Cool Software, General Items, GTD Application Reviews, GTD General and tagged gtd, gtd app, GTD Applications, Hit List, iphone, omnifocus, things on June 4, 2009 by Andrew Mason. I have had a week of report writing yet again. One thing for sure is that my report writing is really improving as is my ability to focus and deliver the report in the given timescales. I am spending the best part of next week down at Earls Court in London for the InfoSec show with my company RandomStorm. We have a booth so if you are at InfoSec or Internet World be sure to pop by and say hi! My first link for this week is a link to a Lifehacker Post on how Steve Wozniak Gets Things Done. Steve Wozniak, or Woz is the original co-founder of Apple along with Steve Jobs and a much loved character. Interesting read to see how the great Woz Gets Things Done. My second link is a great post about Getting Things Done with OmniFocus for the Advanced User. Great to see a post for the more adept user rather than the usual focus on the beginner who is either new to the tool or new to the Getting Things Done Methodology. My third link is a link to a great little collection of Moleskine Hacks from James Mallinson at organizeit. I love my collection of Moleskine’s and I equally love these posts where others that share my passion release cool little hacks around these awesome black notebooks! My fourth link is a link from Jesse Ruderman on how he uses GTD. Jesse is pretty new to GTD and started out after using Things on his Mac to Get Things Done. This is a nice little review of how one user implements the Getting Things Done Methodology. My fifth and last link is a great post that I have featured before but some more sites have been added to it so I will run with it again. it is the 100 GTD Resource Post from Mashable.com. This is a great collection of GTD resources that you can get for free from the Internet. Right, off to start packing for the week ahead at InfoSec and also I have to sort out some tech issues with a VMWare image, wish me luck! This entry was posted in General Items, GTD and Productivity Links, GTD General and tagged Getting Things Done, gtd, moleskine, omnifocus, things, Woz on April 26, 2009 by Andrew Mason. Just thought I would share this cool little screencast showing the features of the Desktop MAC GTD App, Things. 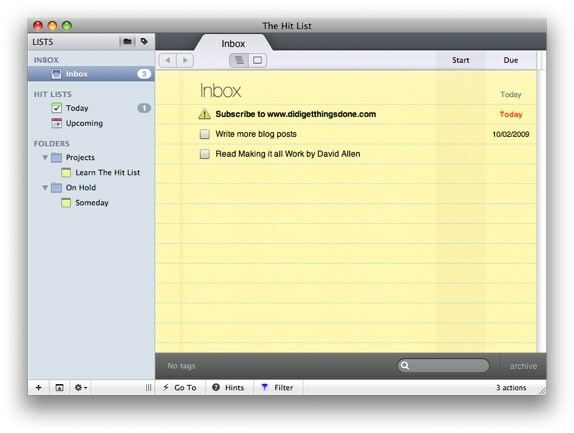 I do not use Things myself as I still prefer OmniFocus but I do prefer the visual look of Things and also The Hit List. Hope you enjoy the screencast! This entry was posted in General Items, GTD Applications, GTD General, GTD Videos and tagged gtd, gtd apps, Screencasts, things on April 24, 2009 by Andrew Mason. Had a great weekend mainly due to the great weather in the UK and I have spent most of it outside. Lit my new Weber BBQ a few times and cooked some great food! This week has seen me away for a few days without Internet access. It is actually quite nice not having connectivity as it really enabled you to focus on the task at hand. My second link is a great post from the Climb to the Stars blog about how the blogger gets organized. MindMaps, Evernote, GTD, all sounds very familiar to me. I like it..
My third link is a link for TimeBoxed, a neat little Mac OS X app that acts as a timer. I have never really been into timing myself but I have started using this app and it is quite enlightening to see where your time goes. This app is very simple and easy to use and integrates with Growl. My fourth link is a link to a great blog I found about via Twitter called Productivity Hacks. The content is very relevant to this blog and the blogger is obviously another Productivity Geek who gets things done on a Mac. My fifth and last link is another comparison between Things and The Hit List as GTD Apps. The latest MacHeist bundle really has done wonders for The Hit List. Just going to the gym now to hopefully kick start my summer workout plan and lose some of the excess winter fat! This entry was posted in General Items, GTD and Productivity Links, GTD General and tagged gtd, Motivation, omnifocus, Organization, productivity, The Hit List, things on April 19, 2009 by Andrew Mason. Had a great day yesterday at ThinkVisibility which was a one day social media, SEO, and blogging conference that was held in my home town of Leeds. Great speakers and I left the day feeling inspired! Here are a collection of links for this week. My first link for this week is a great post on GTDTimes from David Pierce explaining why the Web Works for GTD. David is a reader of this blog and regular commenter and it is great to see him turn his hand to writing, well done and great post! My second link is a link to a post that reviews Things for the iPhone. I briefly tried Things but I am still firmly routed to my GTD App of choice, OmniFocus. My third link is a link to a Helpful Guide on how to Reduce Stress. Nice little post where the author identifies Procrastination as the largest issue. Worth a read or listen as they have the facility to play the blog post via a podcast. My fourth link is a nice list of Top iPhone Apps from the Molanphy Blog. I am posting this link as I read the short review of Ambience and then went ahead and bought it. My fifth and last link for this week is a link to a competition on the Nozbe Blog to win a free pass to the GTD Summit in San Francisco. This is a free gift with a $2295 value and if you are around the bay area a great prize to win! You have to comment on the post at the Nozbe blog in order to stand a chance of winning. Wishing you all a productive week, as always! This entry was posted in General Items, GTD and Productivity Links, GTD General, iPhone Productivity and tagged Getting Things Done, gtd, iphone, nozbe, things on March 8, 2009 by Andrew Mason. I first saw the Hit List via a blog post over at The Unofficial Apple Weblog back in December 08. Well, the application is now at public beta and you can download it to have a play with it. The Hit List has come from the Potion Factory, the people behind applications such as Voice Candy and Tangerine. I would compare The Hit List more to Things than OmniFocus. It looks great, is clean and simple with a great polish. OmniFocus has features coming out of its ears and great integration options. I have downloaded and installed The Hit List. I am also about to embark on a good look at Things 1.0 so I will report back with a review of both the apps. Competition is always good and OmniFocus and Things do have a real competitor here with The Hit List. An iPhone companion application is a must so watch this space as I would love to be able to see The Hit List on the iPhone as well. Take a look and I would love to hear any comments. This entry was posted in General Items, GTD Applications, GTD General, iPhone Productivity and tagged Add new tag, gtd, Hit List, iphone, omnifocus, things on January 9, 2009 by Andrew Mason.